Have you ever heard of a Jew who saved a Nazi’s life? Who evaded capture by pretending to be a Polish peasant, a Communist spy, a partisan, and a Rabbi? Who spent months starving in the woods, sleeping in haystacks in the freezing cold, only to finish off the war in a luxurious palace as the guest of a Polish princess? Over 30 years in the making, this unique and extraordinary account was recreated from interviews the author recorded in the early 1980s, as well as videotaped interviews from Steven Spielberg’s Shoah Foundation. The book describes Binem Naiman’s childhood in the rural Polish village of Radziejow, and details how his family and community were devastated by the trauma of the Nazi invasion and unimaginably cruel occupation of Poland. At the age of 24, Binem escapes a German forced labor camp and struggles to survive the harsh Polish winter by sleeping in haystacks during the day and begging food from peasant farmers at night. Through a chance encounter with a former schoolmate, Binem is taken in by the Osten-Sackens, an aristocratic Polish woman (the “Princess”) and her ethnic German husband, who Binem later learns is a secret Gestapo agent. When Germany begins to lose the war, their son, an SS officer (the “Nazi”), forces Binem to vow to protect his parents from inevitable attempts at retribution. Binem makes good on his promise (three times!) saving Osten-Sacken twice from Russian soldiers and later by testifying on his behalf in a Polish court. 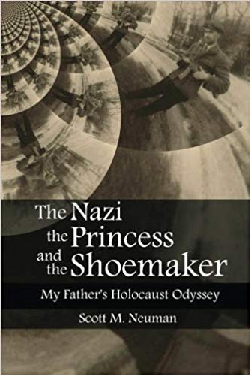 The book describes Binem’s Holocaust experience in harrowing detail, from its lows, including a suicide attempt in the Jewish graveyard where his parents were buried, to its highs, such as finishing off the war as an honored guest at the Osten-Sacken mansion, and his celebratory speech to the Russian Jewish officers who liberated him.